By the medieval period, Southern Italy was populated by Greek, Roman, and Arabic peoples. The area became a natural forum for the exchange of ideas, as sailors, soldiers, civil officers, and scientists traveled the Mediterranean Sea, making it possible for books and knowledge to cross political, religious, and linguistic boundaries. Arabic science spread from Baghdad to Cordova and back, as did Greek, or Byzantine, knowledge, which was disseminated from Constantinople and the Near East to Sicily and Southern Italy. The most famous of the translators working in Southern Italy was Constantine (d. after 1087), a physician from North Africa who had crossed the Mediterranean Sea to Salerno and became a monk at Monte Cassino. Constantine probably followed a local tradition of intercultural exchanges by translating works of Hippocrates and Galen into Latin from their Arabic versions, as well as Arabic treatises such as the corpus of works on pharmaceutical therapy by, or attributed to, Ibn Masawayh, best known in the West as Mesue. Ibn Masawayh (d. 857), Antidotarium. Antidotes were compound medicines originally prepared to treat the effects of venoms and poisons, which, over time, became compound medicines with a broad range of uses. Manuscript E 21, f. 146 recto. Ibn Masawayh (d. 857), Grabadin. Named from the Greek term grafidion (notebook), Grabadin were Arabic medical formularies. 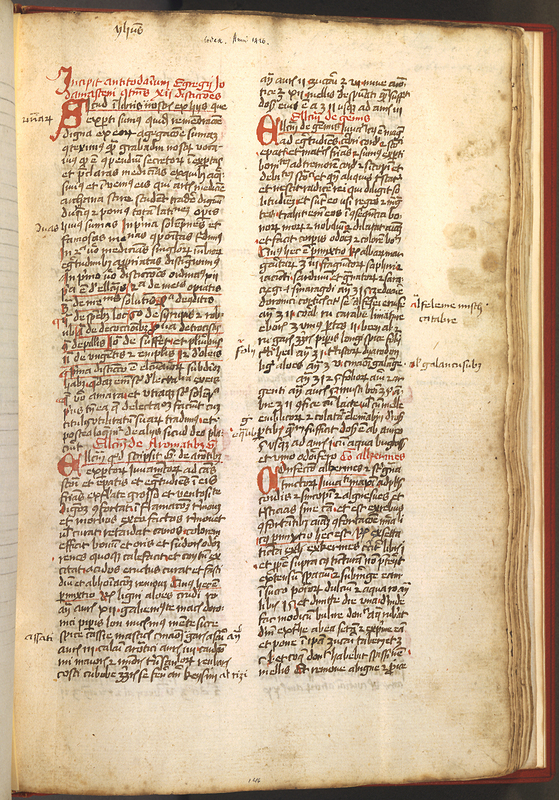 Manuscript E 33, f. 1 recto. Although Constantine the African was interested in recovering Greek science through its Arabic translations and reformulation, Western translators also rendered into Latin original works by Arabic scientists. Hunayn Ibn Ishaq (808–873), Isagoge (Introduction). This introduction to medicine written in Arabic by Hunayn Ibn Ishaq and translated into Latin by Constantine, draws on a similar Greek work by Galen. Manuscript E 78, f. 1 recto. This text is a Latin translation of the collection of formulas for medicines by Râzî better known in the West as Rhazes. 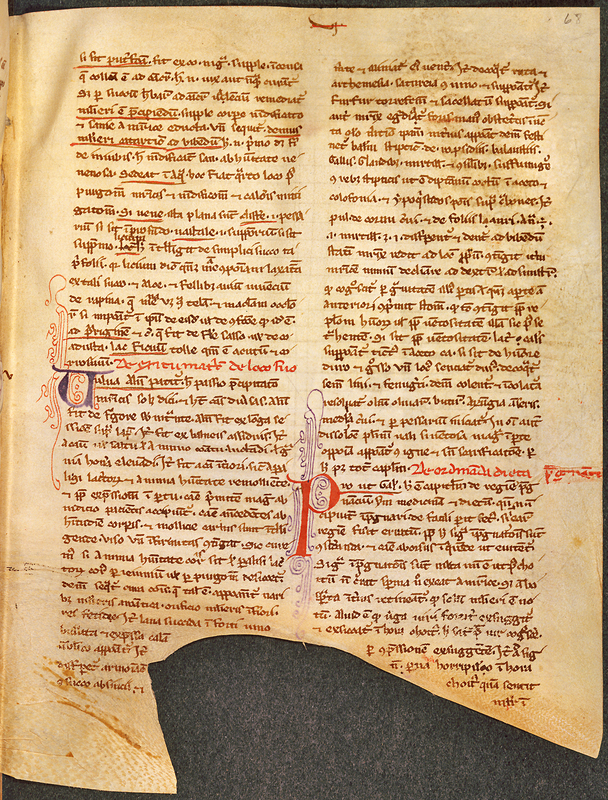 Manuscript E 33, f. 100 recto. Ibn al-Jazzar (d. A.D. 979), Viaticum (Medical manual for the traveler). This encyclopedia of medicine for travelers by the North African physician Ibn al-Jazzar was translated not only into Latin, but also Greek, in southern Italy. 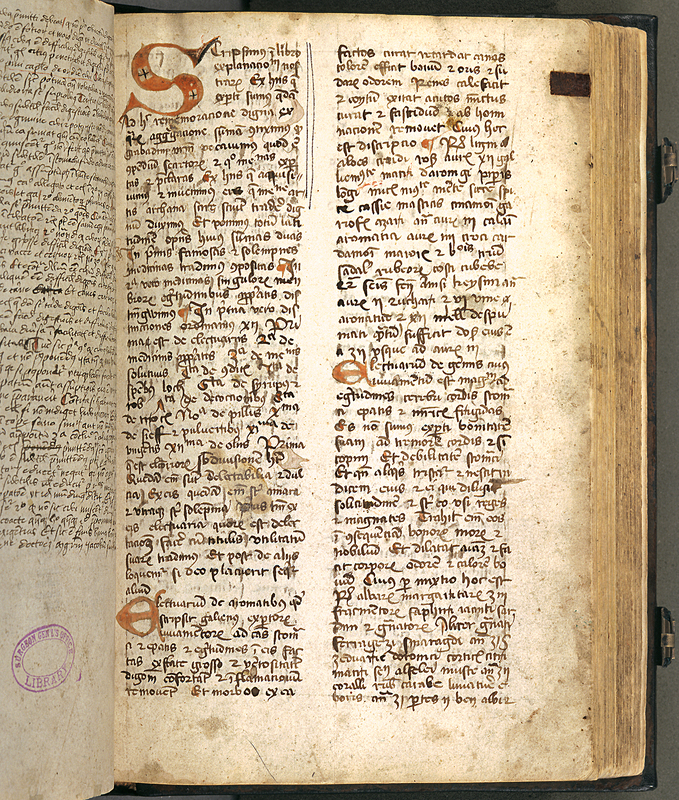 Manuscript E 11, f. 1 recto. Contacts between different cultures and the subsequent introduction of new technical texts required appropriate reference works, such as specialized lexica, particularly in the field of materia medica. 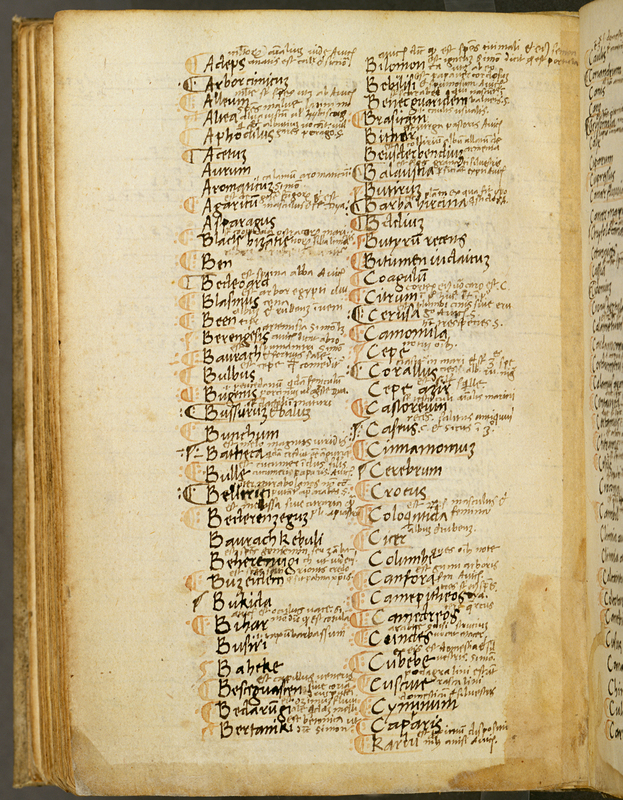 This alphabetical index of materia medica contained in a 15th-century manuscript includes Arabic terms, and illustrates the persistence of such terminology in western medical literature. Manuscript E 26, f. 47 recto. 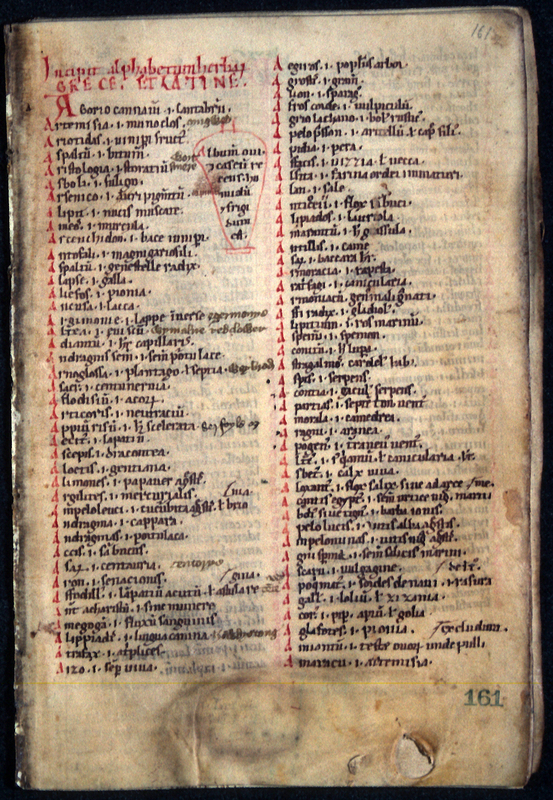 Anonymous, Alphabetum herbarum Grece et Latine (Alphabetical list of plant names in Greek and Latin). This anonymous lexicon in a volume dated to ca. 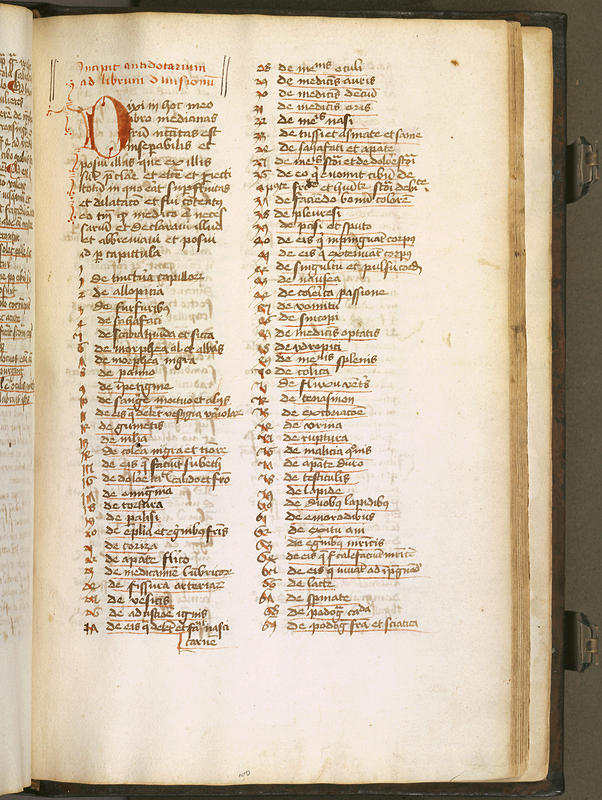 1150 contains Latin versions of Greek medical treatises. 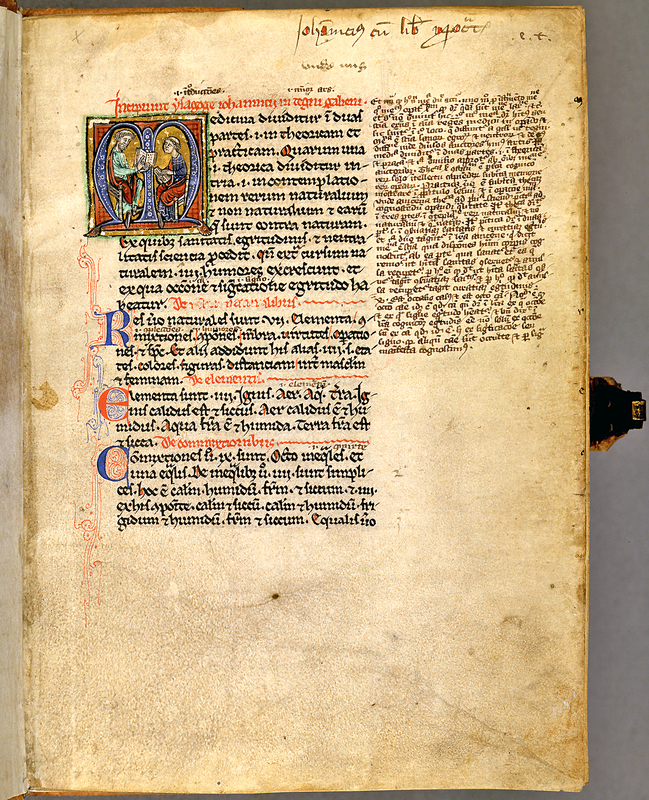 Manuscript E 8, f. 161 recto.